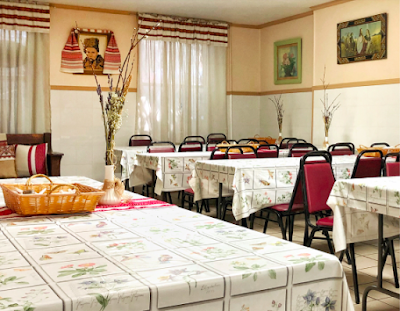 Streecha Ukrainian Kitchen, the basement cafe that serves as a fundraising arm of the St George Ukrainian Catholic Church, is going on its usual summer hiatus after service on Sunday. So if you want to stock up on borscht or vareniki ... they are open until 11 a.m. to 5 p.m. today, and 9-5 tomorrow and Sunday in the basement space at 33 E. Seventh St. between Second Avenue and Cooper Square. Thanks to Alice Owen for the photo! Find more of her work here. Bummer! Went in for the first time for stuffed cabbage and kielbasa and sauerkraut. Delicious! And inexpensive! Can't believe I'll have to wait three months for them to reopen. So few options left for Eastern European food in the neighborhood.